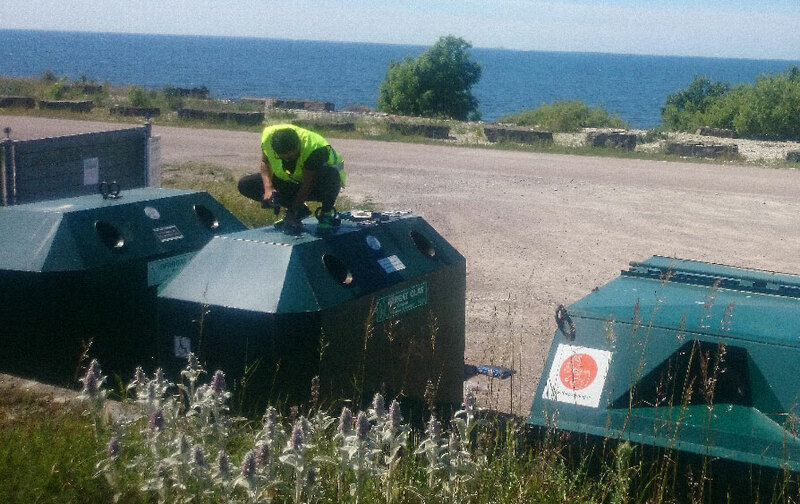 Mounting of transponders on glass recycling containers in Sweden. A new smart recycling system for containers provides information in real-time, optimizes the collection routes, reduces costs, and increases sustainability. Svensk Glasåtervinning (Swedish Glass Recycling) is the best in the world when it comes to recycling glass. The company recycles over 90 percent of all glass packaging in Sweden. To become even more efficient and environmentally friendly the company is now investing in a new smart recycling system. The connected solution is designed by Adage, a provider of smart RFID solutions, in cooperation with Telenor Connexion, a leading provider of IoT solutions. The glass recycling containers, which are located throughout Sweden, have previously either been emptied too often, with negative consequences for the environment and the economy or too often at the risk of littering and with public complaints as a result. The new Smart Recycling solution, which is a cloud-based system for measuring the volume of recyclable containers, makes it possible for entrepreneurs to abandon static collection schedules and to instead optimize the collection routes. Besides large financial savings, the solution also contributes to environmental savings in terms of reduced CO2 emissions. The Smart Recycling solution consists of a transponder and gauges attached to the lid of the recycling containers and uses ultrasound to measure the level in the container twice daily. The information is sent via the mobile network to servers in the cloud, where data is reported and then made available for the contractors in charge of emptying. In this manner, the emptying of containers is planned and optimized in real time. “The Smart Recycling solution fits perfectly into Svensk Glasåtervinning’s approach. The solution will greatly benefit our contractors, who will be able to optimize their collection of containers and thereby be more cost effective while contributing to a more sustainable society”, says Peter Trimmel, Purchasing and Marketing Director at Svensk Glasåtervinning. “We are very excited about the agreement with Svensk Glasåtervinning, which we won in a large international competition. This cooperation will not only contribute to our future development but will also allow us to adress other local and international customers”, says Anders Hermansson, CEO of Adage. “The Smart Recycling solution is a good example of how new connected technology really has the opportunity to make a difference and contribute to a sustainable society. Svensk Glasåtervinning, and other companies in the forefront who understand the value of the Internet of Things, will be able to gain competitive advantages through the use of this technology”, says Mats Lundquist, CEO, Telenor Connexion. In total, more than 6,000 containers will be connected. Deliveries began in June 2016 and by year end about 1,200 containers will be connected. This makes it one of the largest IoT/M2M projects in Sweden at the moment.